Sometimes the best things are the simplest ones, and I have found this to be the case numerous times with food. 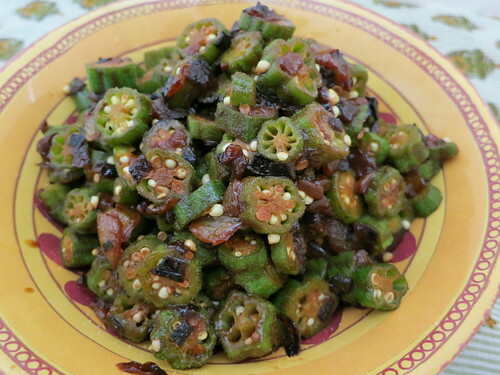 Take this okra dish for instance. It’s just fresh okra cooked with browned onions, a pinch of turmeric, salt, and some lemon juice. That’s it. Yet it tastes so much more than that, to the point that when I first had it at my aunt’s house in Bangladesh this past winter, I was convinced there was some complex preparation involved. I asked what was in it and couldn’t believe it was just 4 simple ingredients (I added the lemon juice in my version). No complex tapestry of spices involved, just the inherent flavors of those ingredients, combining into a homey, comforting dish. I was in desperate need of simple, homey, and comforting this weekend. I’m in the thick of my fall tax season and at a new job to boot. While this new job is much less stressful than my last one, I’ve still been putting in some long hours lately. I’ve been on the go the past 6 weeks and haven’t been able to cook as much as I’d like to. In fact, I’ve been eating out quite a bit and have been getting to the point where I’m sick of it and just want some home-cooked food. Since I had today off, I decided to take some time and putter around in the kitchen. Nothing complicated and involved, just some simple comfort food. Mr. Spice loves okra, so I thought I’d try my hand at recreating the okra dish we’d enjoyed months ago. 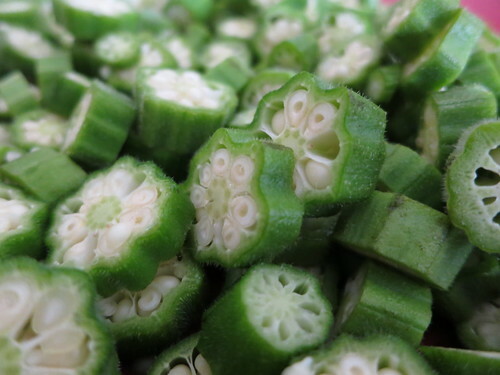 I normally use the frozen sliced okra, but decided to go with fresh okra and slice it myself. There’s just something so soothing and zen about chopping and slicing. 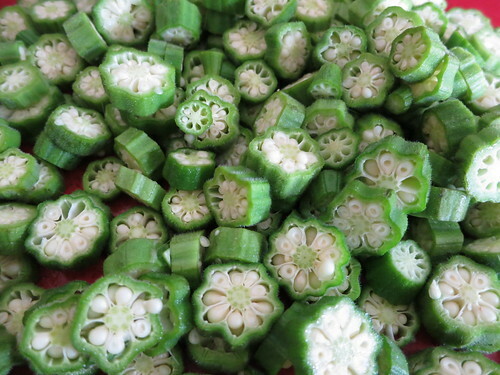 I’d bought a pound of okra, so it took a while to slice it all up. The onions were next, but since I was rough chopping them, it took no time at all. I knew the onions needed to be browned first, so I heated some oil over high heat and then added the onion pieces. Now, I’m sure you’re really not meant to do it over high heat but I’m impatient. I didn’t want to burn the onions, just get them brown-black, but there is a fine line, and to be honest I may have almost crossed it today. But when you’re making them, just be more diligent about about stirring the onions and making sure they brown but not burn. Once the onions were to my liking, I dumped in the okra and coated them with the onions. I added a teensy bit of turmeric ( a little goes a LONG way) and a bit of water, then lowered the heat and put a lid on the pan, letting everything cook together about 15 minutes. After the okra had cooked for a bit, I added salt and tasted it. I had to stop myself from trying to add spices to the okra, somehow still convinced that it needed a little something. But in the end, I compromised by adding some lemon juice and let the simple, pure flavors shine through. Once the okra had cooled, my fears were put to rest. The aroma of the browned onions permeates the dish with a nutty, rich flavor and the salt and lemon juice perk things up a bit. Simplicity at its best! 1. Heat oil over high heat in a large frying pan. 2. Add onions and cook on high until pieces start to brown, then turn heat down to medium-high. Continue to fry onions, until pieces have begun to turn dark brown, almost black. 3. Add okra to pan and coat pieces with onions. Add the turmeric if using, then a bit of water to prevent the okra and onions from sticking to the pan. 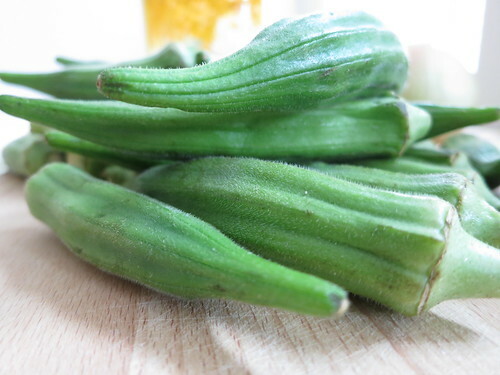 Lower the heat to medium-low and cover, cooking for about 15 minutes or until okra is done to your liking. 4. Taste and add salt and lemon juice to your taste. Let okra cool, then serve. 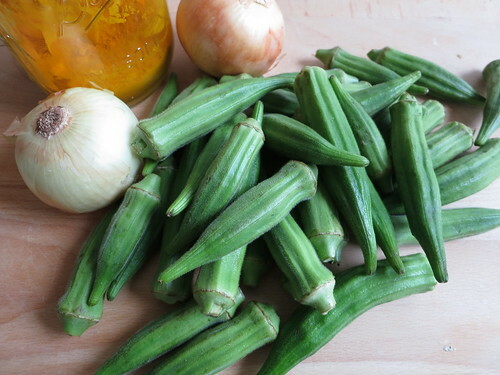 I’ve never cooked with okra before, but this recipe is making me seriously want to! This looks delicious. Thanks for sharing the recipe! Yummy! Cooking the onion on medium high may take a little longer but the onion is less likely to burn. Good post. I made this (and the masala marinated beef last night). 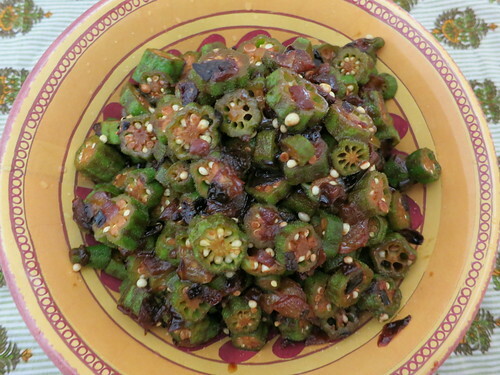 I do not like okra, but I enjoyed this dish! That looks delicious – and maybe even simple enough for ME to try! Previous post: Jhal Muri with Crispy Brown Rice + Attune Foods Coupon Giveaway!